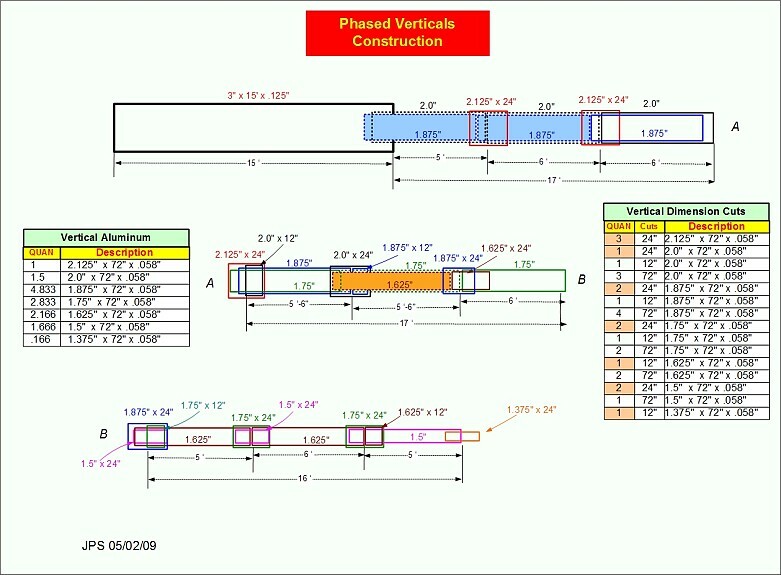 The 2 element, phased verticals for 160 meters, project was started in 2007.
bidirectional between EU-AS and NA-AF. 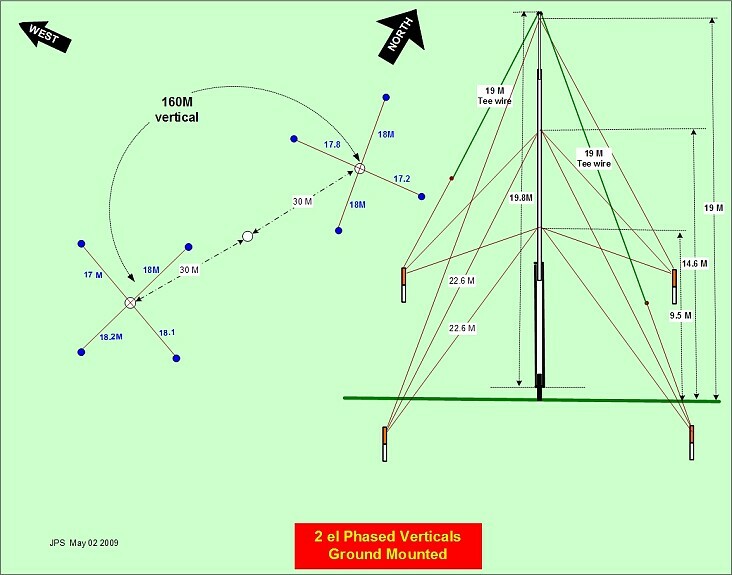 The two 21 meter T top loaded verticals can be seen on each side of the tower.The spacong is 3/8 wavelength. The array is oriented on 30 degrees. The masts are guyed with tarred nylon marine cord. A single vertical tubing material list. The longest tube is 15ft(4.6M). All other tubes are 6ft (1.8M)or less. Most joints are triple-wall. 75MM base pipe for vertical mast. The base pipes aer spaced at 60 Meters with 1/2 yard of concrete. This is a view of the overlapped triple-walled joint. 3 Tek screws are used on each side of the joint. The tarred nylon ropes are attached woith a hose clamp at 3 levels. Each level has 4 ropes for 4 direction guying. Hinged base to allow easy tuning. 2 galvanized automotive muffler clamps secure the mast when vertical. Mounting the insulator to the hinge bracket. Vertical mast shown in the raised position. 4 people are required to rase the mast. Top view in the raised position. Hinged base keeps the vertical insulator 75mm from the ground. Radials with ring. Only 20 radials attached due to weight. The radials are rolled up and removed after each contest. The radials are attached to the guy ring with stainless steel bolts. L network matching unit. The 180 degree rg302 toroidal phase shifter is shown in the upper center. This toroid switches the array between Endfire and Broadside. The white wire is the feedpoint wire. The 1/4 wave 9913 feedline can be seen on the right. A view of the NE vertical from the South tower. The EU-SA beverage can be seen in the distance. 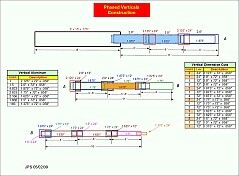 Both verticals can ve seen on each side of the tower. 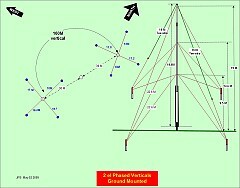 The SW vertical mast. This is the old design that taperered to .75" (20 mm) at the tip. This design failed in moderate winds. The new SW vertical is much stronger. The top of the mast is 1.5 "(38 mm) diameter.